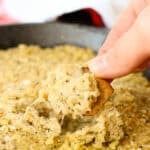 Stuffed Artichoke Dip is a creamy warm dip recipe bulked up by a hearty and healthy ingredient. Drain and rinse artichoke hearts and cannellini beans, then add all to the bowl of a food processor. Blend until the artichoke/bean mixture has a smooth consistency. Transfer mixture to a bowl. Stir in breadcrumbs, Parmesan, garlic, onion, basil, olive oil, salt and pepper until evenly distributed. Transfer mixture to a cast iron skillet or a large baking dish (about 9" x 13"). Sprinkle remaining 3 tbsp breadcrumbs over top of dip, then drizzle remaining 2 tsp olive oil. Bake until dip is heated throughout, approximately 15 minutes.